For the uninitiated, it is very important to understand the U.S. Department of State has become the face of rampant institutionalized criminality of the highest order. This crime spree has been perpetrated around the globe by the leaders of various administrations of the U.S. Federal Government. The State Department puts lipstick on the pig known as the Central Intelligence Agency (C.I.A. ), as it does on the NSA, DIA, DEA and many other rogue agencies throughout the U.S. Government. With this knowledge it ought to be easy to understand that every U.S. embassy around the world is simply a snake pit of CIA spooks, NSA operatives, DIA officers, DEA agents and the like. This is where they all go to coordinate the latest color revolution or civil war, city square protest or staged riot, drug trafficking scheme or gun-running operation. Every Secretary of State to serve over the past many decades has been forced to join a government-wide conspiracy to commit war crimes. It is literally a part of the unwritten job description, just as the POTUS is pre-selected based on their willingness and commitment to prosecute unprovoked wars of aggression wherever they are ordered to do so. Hence, Hillary’s crimes against humanity are only different from her predecessors in the sheer depth and breadth of her high treason and transgressions of law. The main point here is that Clinton was chosen for her willingness to carry out a warmongering agenda against large swaths of the Middle East as well as various regions in North Africa. This is the very reason why she was ordered to set up a home-based server and private email domain with which to illegally conduct official State Department business. She had to keep all the incriminating correspondence completely off the radar lest she and her accomplices be implicated for war crimes. 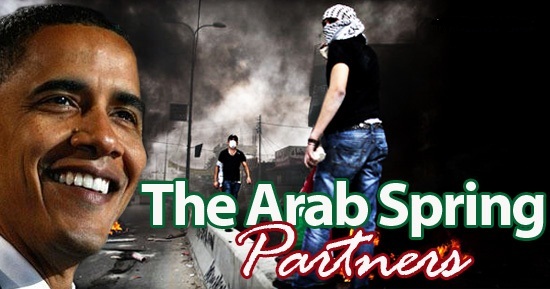 The Arab Spring was nothing less than a US-UK-Israeli enterprise designed to accelerate the Greater Israel Project. The advancement of this particular project is central to the reason why Obama was installed as POTUS and Clinton as SOS. These two co-conspirators formed a tag team whose mission it was to turn the Mideast into a dystopian apocalyptic wasteland. And so they have. Because Clinton and Obama collaborated so closely to implement the CIA-designed scheme known as the Arab Spring, they have been obligated to provide each other cover. Were all 31,000 plus emails to be made available for public scrutiny, it would be revealed that Obama is as guilty in the Emailgate fiasco as Clinton is. He was also a party to her illegal server since he corresponded with her using that email while transmitting highly classified information. The ultra-secret info and classified data, related directly to the execution of the CIA’s Operation Arab Spring, forms the very basis for Emailgate and Servergate. Both Clinton and Obama conspired unceasingly to deceive the American people into believing that this was an organic, home-gown movement when in fact the C.I.A. & Company paid out millions of US dollars to get the various countrymen to the city squares to protest. This highly coordinated black operation is still the best kept secret in Washington, as it is throughout the power capitals of the world. And so it better be for their sake, since the very creation of ISIS was a central part of their patently illicit and traitorous plan. 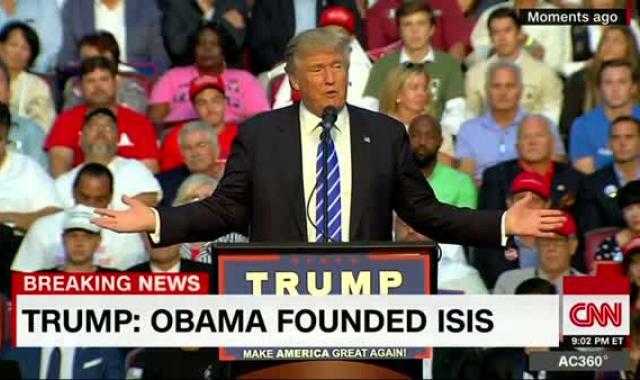 Given the intense scrutiny that Donald Trump operates under every single day of his campaign it ought to be understood that he would not accuse President Obama of creating ISIS unless it was true. He has also identified Secretary of State Clinton of being a co-founder. Clearly, Trump is in the possession of classified information which proves his point that Obama and Clinton were both instrumental in the establishment of the Islamic State, the support of ISIL expansion, and the arming of the Daesh across the Northern Levant. As if this proclamation by Trump is not enough to get the whole Washington Establishment thinking very hard about their respective complicity in this pervasive criminal conspiracy, there is also a highly respected physician in Arizona who has announced the very same government conspiracy while running for the Senate. Dr. Kelli Ward also identifies Senator John McCain as a key co-conspirator. The video that follows is truly a blockbuster as such allegations have never been uttered in the history of U.S. Congressional elections. If these three videos do not send up red flags all over the electorate then nothing will ever. The profound import of these allegations in such that a veritable sea change is about to take place within the American body politic. The Second American Revolution has just begun and these weighty accusations are only the beginning. If those in power do not vacate their positions of power and influence post haste, they will undoubtedly get caught up in a fervor for justice not seen since the infamous French Revolution. Yes, it will be a political bloodbath the likes of which this nation has never seen. It ought to now be crystal clear that Candidate Clinton had no choice but to run for POTUS. With all her serious health problems — both physical and mental, emotional and psychological — she and the aging Bill no longer have the capacity to deal with what is about to come at them. Simply put, neither of them possesses the intestinal fortitude to undergo a process that will be infinitely more gut-wrenching than Watergate. This is NOT about a silly burglary of virtually no consequence; rather, this is about a massive criminal conspiracy to overthrow legitimate governments and wage war against innocent peoples across the Mideast and North Africa. 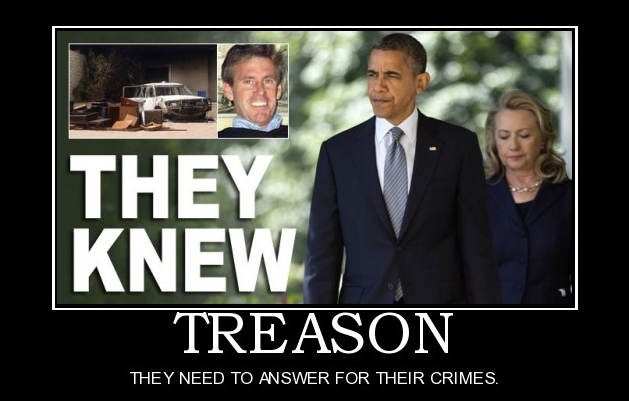 Not only is a Clinton presidency seen as the only way to keep herself and Bill out of prison, it is the only way to keep Obama from being sent to the International Criminal Court at The Hague to face charges of war crimes and worse. Many throughout the world community of nations would like nothing more than to see these two war criminals sentence to life imprisonment, if not a much worse punishment. Husband Bill is equally guilty of war crimes and crimes against humanity not only for his utter devastation of Yugoslavia, but also for his collusion by way of the Clinton Foundation with his wife at State. This fake NGO is actually a CIA front that has been used to infiltrate countries across the planet in order to subvert those regimes that the White House has deemed unfriendly. The Clinton ‘nonprofit’ foundation played an integral part in various aspects of the Arab Spring and so is guilty of the same war crimes and corrupt exploitation by way of disaster capitalism. It’s true that SOS Clinton and husband Bill functioned as a parallel government throughout her tenure at State. This extremely unusual and unlawful arrangement was necessary in order to implement so much of the Arab Spring subversive activities which had to be hidden from the American people. Were the truth to be known about the degree of outright criminality that was perpetrated, they both would have been permanently barred from participating in political life, if not banished altogether from the USA. Yes, their collective malfeasance and perfidy, malevolence and treachery are unparalleled in U.S. history. Because of what is truly at stake, Hillary’s run for the presidency is literally a “Do or Die” proposition, not only for her and Bill, but for the whole NWO crowd that zealously supports her. It is the career criminals like George Soros and Zbigniew Brzezinski, Henry Kissinger and Brent Sowcroft, Robert Kagan and Henry Paulson, John Negroponte and Richard Armitage whose heads are really on the chopping block. For it is these and many more bad actors who have been manipulating the American electoral process over decades in order to shoehorn extremely compromised candidates into elective office so that they can be easily coerced into carrying out what is essentially a nefarious agenda. Just as the exceedingly corrupt Democratic Party permitted Clinton to steal the primary from Bernie Sanders, the very same cabal of thieves is intent on stealing the general election from Donald Trump. There is no other way that Clinton can win except through coordinated use of widespread voting fraud and election tampering tactics. Trump’s popularity throughout the electorate is so strong that nothing less than an overwhelming landslide victory is quite likely. The only way for the Clinton Crime family to offset this reality is through their collusion with the MSM, which they have been working on a daily basis. In fact, only by rigging the entire electoral process and and controlling the MSM do the Clinton’s hope to keep the U.S. government-directed ‘ISIS Conspiracy’ under wraps. Along with Obama, they both have no other path to avoiding a lifetime of incarceration except to conduct a naked election theft. All of the most accurate polling data clearly indicates a Trump victory, especially in the critical swing states. Therefore, any major movement toward Clinton in those states ought to be viewed with a high degree of suspicion. The whole world will soon witness the utter desperation of the Democratic Party. Most of their leaders helped create, arm and support ISIS and their rampage of terrorism in the Levant and beyond. Many of their Executive Branch appointees were in on this complex conspiracy to take over the oil and gas supplies, as well as refineries and conduits, throughout the entire Mideast. In the process, hundreds of thousands have been ruthlessly killed while millions of others have been forced from their ancestral lands. The whole world has witnessed the largest mass exodus in human history. 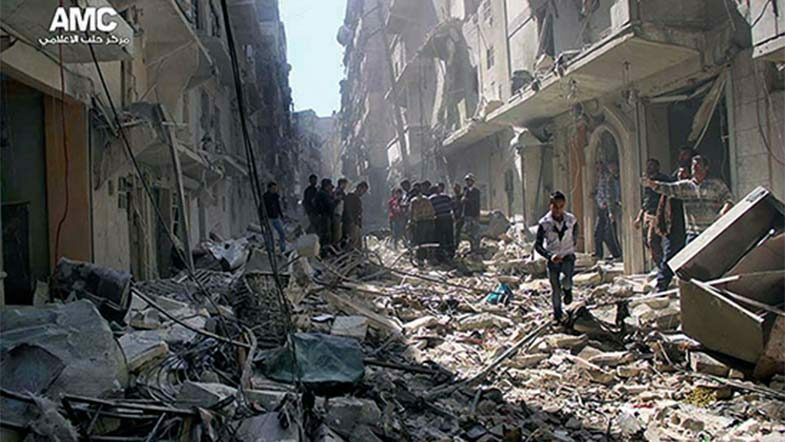 They have likewise seen and heard the gruesome stories about the worst terrorist group in modern times. Nothing but murder and mayhem, death and destruction have occurred as a result of the Clinton’s parallel government and Obama’s lawless presidency. Such is the true legacy of the unprecedented Obama-Clinton partnership. Democratic Voters BEWARE. Your Wrong Vote Will Bring Our Ruin. And Especially Your Ruin.